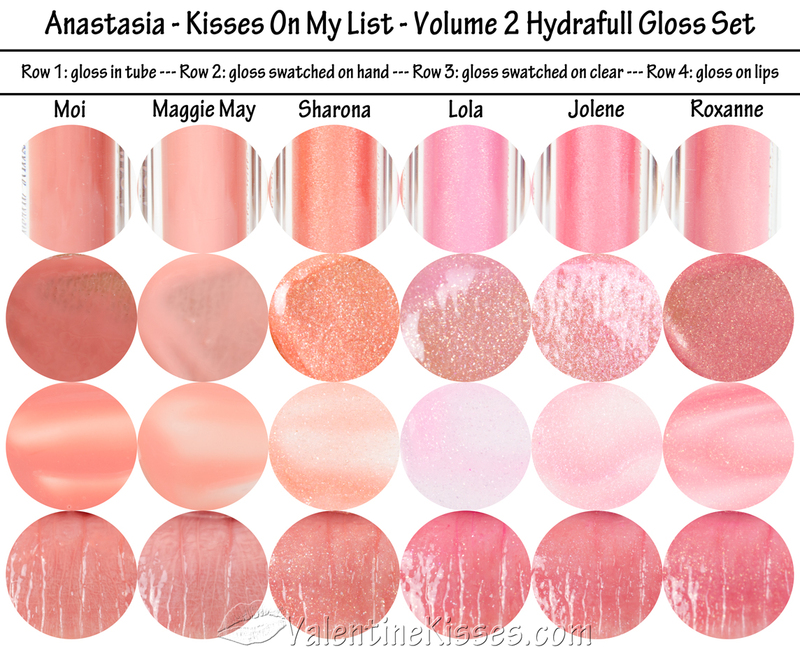 I recently had the opportunity to try the limited edition Kisses On My List Volume 2 Hydrafull Gloss Set by Anastasia Beverly Hills, which is available online and in Sephora stores. The set includes a half dozen, full-sized Hydrafull Lip Glosses, three of which are made with an exclusive Hypercolor formula that reacts with your body chemistry for a glossy lip stain that’s unique to you. Since Hydrafull glosses cost $18 individually, at $30 the kit offers a savings of nearly $80 when compared to buying each on their own. For an amazing assortment of swatches of this set, check out the Valentine Kisses site, which features each product photographed four ways: In the tube, on the tester’s hand, on a transparent slide and on the tester’s lip. Each .07 ounce tube is clear with a silver top and Anastasia Beverly Hills logo. The set is packaged in a black and gold paper box that corresponds with the Want You to Want Me eye makeup kit. Both sets are limited edition and were designed and named as a nod to classic music of the 70s and the muses who inspired some of the era’s most popular hits. The manufacturer promises “long-lasting color that’s clinically proven to improve the appearance and texture of the lips.” Of the testers in the set’s clinical study, 90 percent said their lips felt hydrated and 83 percent noticed an improvement in their lip texture. Follow ups 10 minutes and four weeks later, 90 percent of testers said they experienced noticeable, long-term lip moisture. This set didn’t transform my lips on the long-term as far as I could tell, but while I was wearing them I loved the color. In fact, all the colors were “keepers” for my cool-toned fair complexion. They stayed on well but reapplication is necessary after eating or a few hours of wear. The plastic paddle applicator is somewhat new, and is certainly not as plush as the typical gloss wand, but it is more hygienic than its fluffier cousin. They are well-priced for a holiday stocking stuffer or birthday gift.